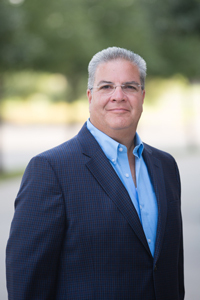 Baylor>Department of Religion>Our Faculty>Faculty>Carlos F. Cardoza-Orlandi, Ph.D.
Carlos Cardoza is a Puerto Rican, husband to his high school sweetheart, Aida Lizzette Oquendo (Lizzie), and father to three adult sons, Carlos Andrés, Juan, and Esteban. He enjoys spending time with family and sharing una tacita de café with family and friends. He is passionate about teaching, learning, justice, and a daily re-discovery of the gospel. Carlos Cardoza is an interdisciplinary scholar and historian in the fields of world Christianity and mission studies. His interests intersect and interplay (1) the historical and current interpretations of the movement of the Christian religion (transmission, reception, appropriation and re-transmission of the Christian religion), particularly in the global south (Africa, Asia & Latin America) both at institutional and popular levels; (2) the socio-religious and cultural interplay between Christians and people of other faiths, particularly those who practice Afro-Caribbean, Amerindian, Spiritist religions, and Islam; and (3) the theoretical and theological/missiological constructions of the current interplay between cultures and religions in Africa, Asia and Latin America, including immigrants and transnational movements. Consultant & Adjunct Faculty for Instituto de Ciencias de la Religión, Universidad de la Habana y Seminario Evangélico de Matanzas, Cuba (2011 to the present). The 2014 Orlando E. Costas Preaching Award, Palmer Theological Seminary, October 2014. Book Award for Excellence in Missiology, To All Nations From All Nations: A History of the Christian Missionary Movement with Justo L. Gonzalez, (Nashville: Abingdon, 2013). American Society of Missiology, 2013. Building Bridges Award, Islamic Speaker’s Bureau of Atlanta, November 2007. Mission: An Essential Guide (Nashville: Abingdon, 2002, also available in Spanish, Portuguese and Korean). “La biblia, la mar y el Caribe/The Bible, the Sea, and the Caribbean Late 19th to Early 21st Century,” Colonialism and the Bible: Contemporary Reflections from the Global South, eds. Tat-siong Benny Liew and Fernando F. Segovia (Lanham: Lexington Books, 2018). “Interreligious dialogue: Why should interreligious dialogue matter for our Academic and Grass-roots Communities? Reflections from a Latino/Caribbean Scholar,” chapter in A Companion to Latino/a Theology, edited by Orlando O. Espín, (London: Wiley-Blackwell, July 2015).